FIRST: "Theistic evolution" is a serious rejection of scripture in many ways. Just 3 examples now. (3) Theology that contradicts the Bible by saying God took millions of years to create then bankrupts God's promise to Christians that at the Lord's coming we will be transformed "in the twinkling of an eye". This is just the short list. Beware that your church is not flirting with this blasphemy. SECOND: TRUE SCIENCE BEAUTIFULLY AGREES WITH SCRIPTURE - DON'T BELIEVE OTHERWISE. This site will continue to add information about this. 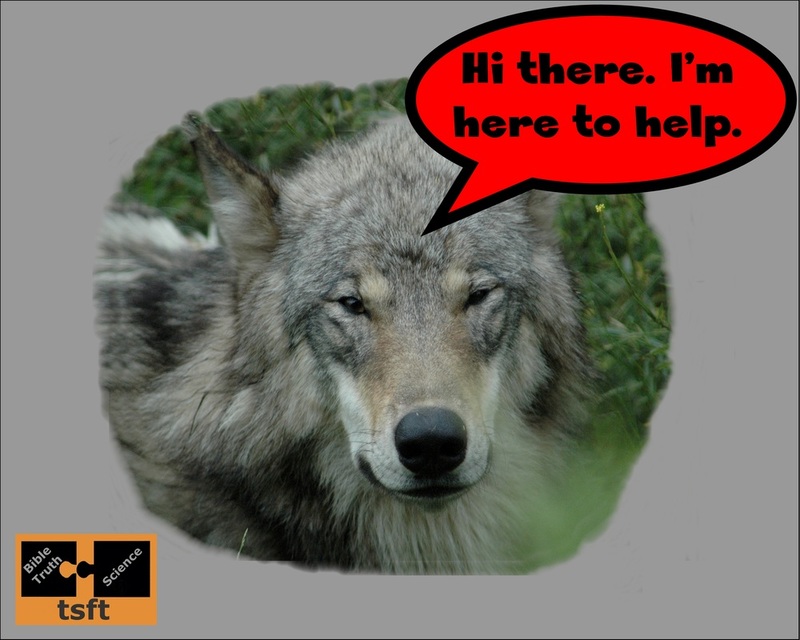 THIRD: BEWARE THE WOLF IN YOUR CHRISTIAN UNIVERSITY OR CHURCH. 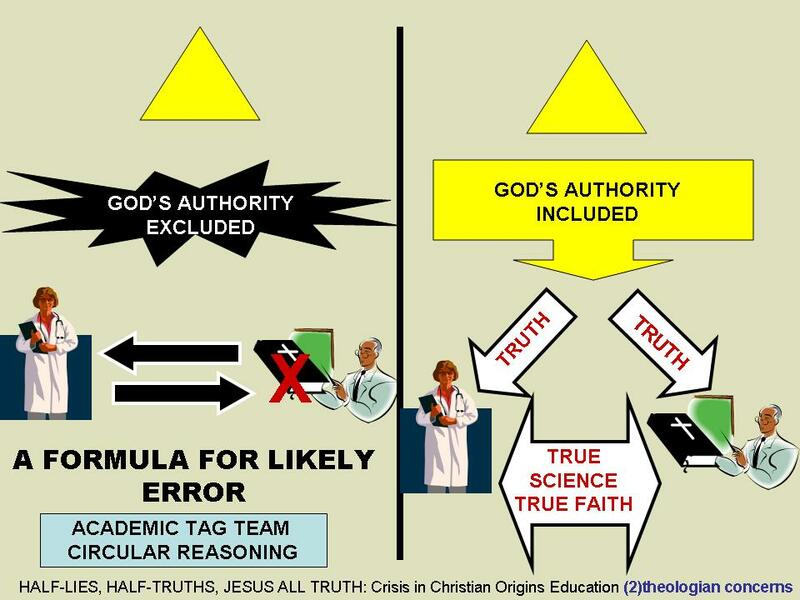 Many organizations fundamentally opposed to the Gospel of Jesus Christ - such as the John Templeton Foundation, BioLogos, the American Association for the Advancement of Science and others - bring money and offer to help Christian schools incorporate a false "science" into theology curricula. Sadly, such "help" functionally translates into bending the scripture in order to accommodate a current common consensus of scientism which they call "science." Again sadly, many Christian schools have abandoned caution and welcomed such "help." This has no upside and the downside is a deep chasm. A short list includes the Catholic Church at their Gregorian University Vatican conference in 2009, Pepperdine University in a 2009 Darwin conference, Fuller Seminary in Los Angeles in a variety of instances, Multnomah University (Seminary) in Oregon with a recent AAAS grant, and very possibly your local Christian school wherever you are. More discernment and caution must be demanded of Christian educators. Please enter into this discussion with the leaders of any Christian academic institution you are involved with - or before you become involved. When Pepperdine University abandoned the Genesis record of creation in order to bring in "theistic" evolution, TRUTH was the loser. So were we all. Denver Real Science Radio host Bob Enyart brings seven observations, each of which logically defeats the scientism of evolution. Pepperdine alumnus Vern Bissell gives seven examples of science moving toward support of a literal reading of Genesis, then seven (plus one more) evidences of concern that Christian theologians are running away from the Genesis record. Vern's alma mater is in the mix. Dr. C K Thong, author of Faith of Our Fathers: The God of ancient China is identical in nature and power to the Creator God YHWH of the Bible. Based on: (1) Imperial sacrificial system, (2) concepts of God in ancient documents, (3) records and interpretations of astral events, (4) expert opinions of 17th and 18th centuries AD, and (5) ancient ideologies embedded in Chinese characters preserved in oracle bone and bronze-ware writings. Ancient Chinese pictographs show stunning correspondence with events of the Bible's Garden of Eden and the Flood of Noah. True Science for Theologians conference, Los Angeles, May 2015. 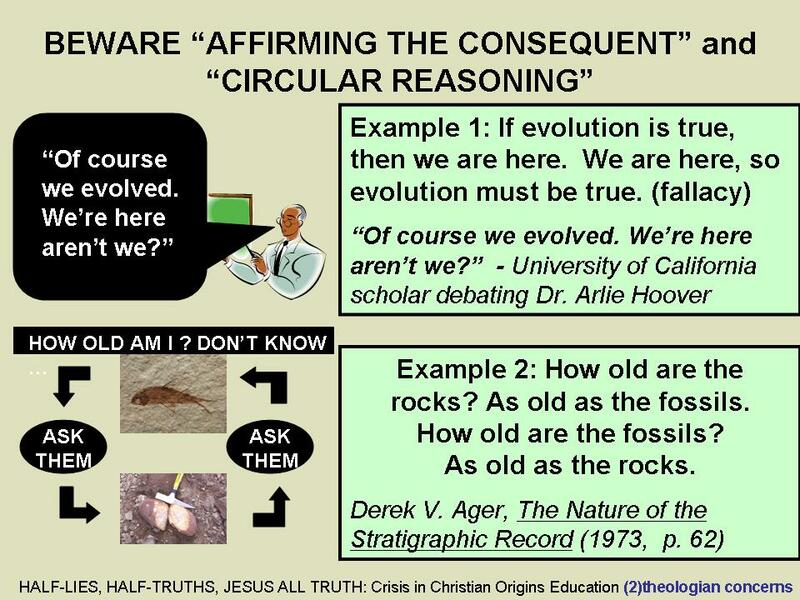 For discussion of "circular reasoning" images below, see discussion at right. ﻿﻿MORE ABOUT BEGINNING WITH THE ANSWER BEFORE ASKING THE QUESTION﻿ ...﻿ This is the line of demarcation between deductive and inductive reasoning. Deductive reasoning begins with a statement taken axiomatically as truth and then seeks out inferences that flow from that. The problem in life as well as in the sciences is that beginning truth is sometimes hard to come by. Hence IR, the inductive method of reasoning. Usually credited to Sir Francis Bacon, IR begins with a measure of humility before observations or experiences. That is, observations supersede personal pet ideas. Observations or experiences then lead to generalized hypotheses (statements to which truth tests are then applied) which can can then be discarded or firmed up as further tests are performed. Inductive reasoning is the foundational basis of modern empirical science. 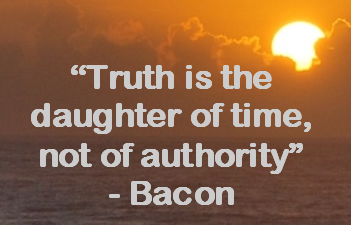 Bacon's famous "truth is the daughter of time" is an elegant seed of modern empirical science. Now let's step back to the statement that "beginning truth is hard to come by." We here now exhort Christian scientists and theologians to begin with the Creator and His Truth both personally and academically. Actually, if you believe that Jesus is "the Way, the Truth, and the Life", you must begin with His Word and words. 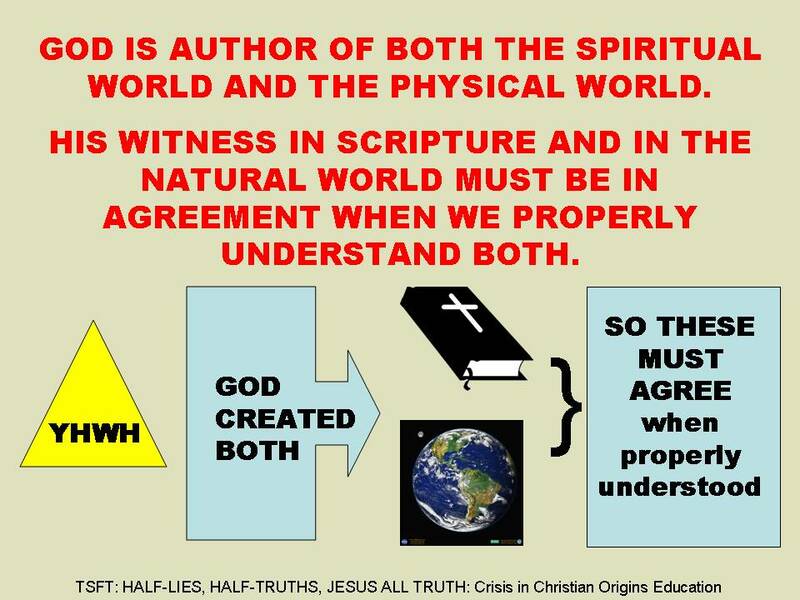 And make no mistake, His Word is affirmed by INDUCTIVE reasoning with truth test after truth test after truth test after ... . Be sure to watch Bob Enyart's video on "original tissue fossils." Yes, Christians and Jews who read and believed Genesis knew soft tissue fossils should be found, yes we knew there would likely be measureable C-14 in some dinosaur fossils, etc. etc. and on and on. It's actually becoming comical. Creationists continue to drag evolutionists back to reality (vestigial organs, germ theory, "junk" DNA, micro- vs. macro-evolution, C-14 in coal and diamonds, living fossils ("stasis"), embryology and recapitulation theory, genetic entropy takes things DOWN not up, hard data calibration of bio-molecular clocks, and on and on. It's like repeatedly having to fetch your slow-learning dog who keeps running into the street. "Bad dog, bad dog!" Scoldings like that might be needed as an antidote for example against the arrogance of a Kevin Padian, U.C. Berkeley paleontologist, whom I saw in a video clip recounting the wonders of walking whale evolution that he had just been to Michigan to peek at. "You really have to be blind or three days dead not to see the transitions among these. You have to not want to see it," said Dr. Padian. Problem was, Dr. Padian the UC paleontologist did not see the potentially fraudulent elements in Pakicetus, Ambulocetus, and Rodhocetus. Who was blind? Who did not want to see? (not a rhetorical question). There is a lot of that going around so watch where you step. Especially Christian teachers, scientists, and theologians should remember to use God-provided assistance: "Thy Word is a lamp unto my feet and a light unto my path." And bringing it back to our beginning point, be careful about your beginning point. DANGER IN "PURPOSE-DRIVEN", "SEEKER-FRIENDLY", and EMERGENT CHURCH PHENOMENA. TRUTHSEEKERS discuss from Joseph Schimmel "Submergent Church" video segments. Megachurch movements in USA seem to purposefully pry independent churches loose from Bible-based roots. The strategy of focusing on "leadership" and "change" has proven tragically effective in moving churches gradually but invariably toward denial of authority of scripture and authority of Jesus, and then often beyond into mysticism and/or political globalism. Large-scale "leadership" initiatives seem to be the most prominent vehicle opening up churches to new-age attacks against Jesus the Christ of the Bible. Prominent names in the emergent church movement produce very not-nice words like "jihadist Jesus." You and your church leaders need to inform yourselves on these many voices drawing churches away, whether intentional or unintentional, from basic truths of the Bible. Consider Jehoshaphat, the king in Jerusalem who thoughtlessly sided with the enemies of God's people ... but humbly accepted a rebuke and became one of the greatest leaders of Judah. 4 So Jehoshaphat lived in Jerusalem and went out again among the people from Beersheba to the hill country of Ephraim and brought them back to the Lord, the God of their fathers." Pepperdine 2007 alumnus Clint Loveness is concerned about evolution teaching at the 2014 Bible Lectures, shares personal concerns, wonders why he never really heard about Christian apologetics until after he left this recognized Christian school. Then Clint tells what he has done and is doing about it. Akkadian "Temptation Seal" ca 2200 BC gives independent corroboration of the Genesis historical record of the "Fall of Man"
Cast perhaps in the time of Abraham ca 2000 BC, the "Sacred Tree of Sanxingdui" of China archaeological find may be the most Biblically important of the 20th century. Nearly 4 meters (13 feet) high, this bronze sculpture stunningly depicts the temptation of Eve and the ensuing "Fall of Man." To modern theologians who twist Genesis scripture, can this be God's way of saying "Twist this!" ? "Tag team" refers to wrestling competitions where contestants can trade in and out, taking turns fighting opponents. 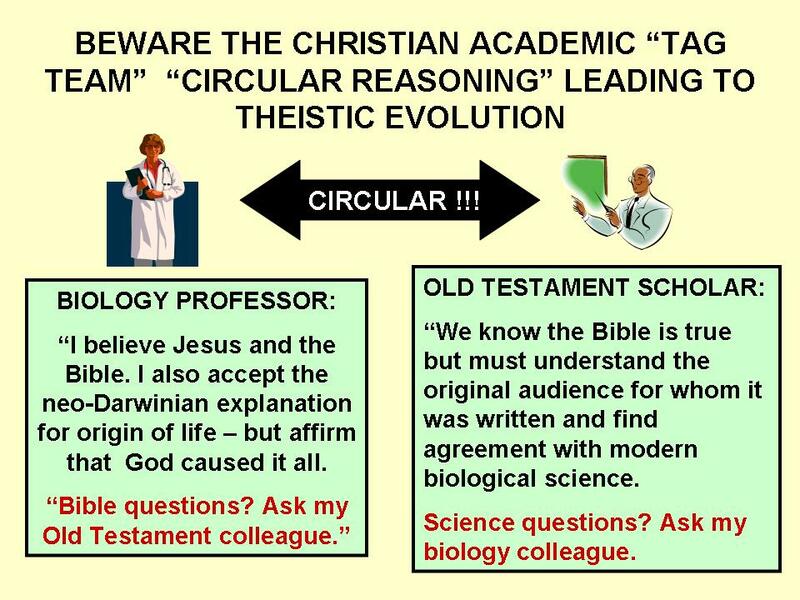 Though practitioners may be unaware, the toxic combination of Christian evolutionist biologists with Christian evolutionist theologians enables perverse tag team circular reasoning. It happens like this: the theologian accepts the biologist truth claim of evolution so bends and twists the Bible to accommodate. The Christian biologist accepts the theologian assurances that the Bible can accommodate evolution and so abandons caution and proceeds with uncritical acceptance of the "current science consensus" of evolution, which at its core is pure scientism and purely not true science. This was clearly on display at the 2014 Pepperdine Bible Lectures when the biology professor said theology questions needed to be directed to the Bible guys, while the Bible guys said science questions were to go to the science professors. Fair enough - except for one detail. Neither was asking what God had to say on the matter. Ooops, major oversight. When we have the scripture for a head start on truth, why ignore it? See the panel at the left. CREATION, FALL, and FLOOD in CHINESE HISTORY AND WRITING. Dr. C K Thong, author of Faith of Our Fathers, says the Bible record of CREATION, the FALL, and the FLOOD - plus ancient man's relationship with the Creator God - are independently affirmed in Chinese history and writing. True Science for Theologians May conference TSFT15. Malibu, California. 42 min. Dr. C K Thong was sad that becoming a Christian in Singapore left him feeling he had rejected his Chinese heritage. Dr. Thong was overjoyed that after moving to Beijing his research revealed that the Creator God worshiped by ancient Chinese is identical in character, nature, and glory as the God of the Judeo-Christian Bible. And there is much more. CK explains why the saying "one more Christian means one less Chinese" is so terribly opposite of truth. About the one God worshiped by ancient Chinese: (1) one God created all things, animals, people; (2) the Creator God loves Chinese people; (3) was addressed as "Father" by emperors; (4) emperors understood themselves to be servants of this great God; (5) humans are unworthy of this God because of our wrongdoings; and, (6) ancient worship of the Creator God amazingly parallels worship of YHWH in Jewish-Christian history. Also special in this interview is discussion of the ancient "Sacred Tree of Sanxingdui" discovered in western China in 1987. Also known as the "temptation tree", this 4 meters tall bronze artifact is considered by some to be pivotal in rewriting ancient Chinese history. Interview by Bob Enyart of Denver's Real Science Radio, True Science for Theologians May 2015 conference, Los Angeles.